After nearly 2 months of doing little but pack and unpack, I’m moved at last and actually have spare time on my hands. All that effort has left me too knackered to explore the delights of Lancashire quite yet so other than the odd Xmas excursion I’m going to do as little as possible this week and play an old game or two. 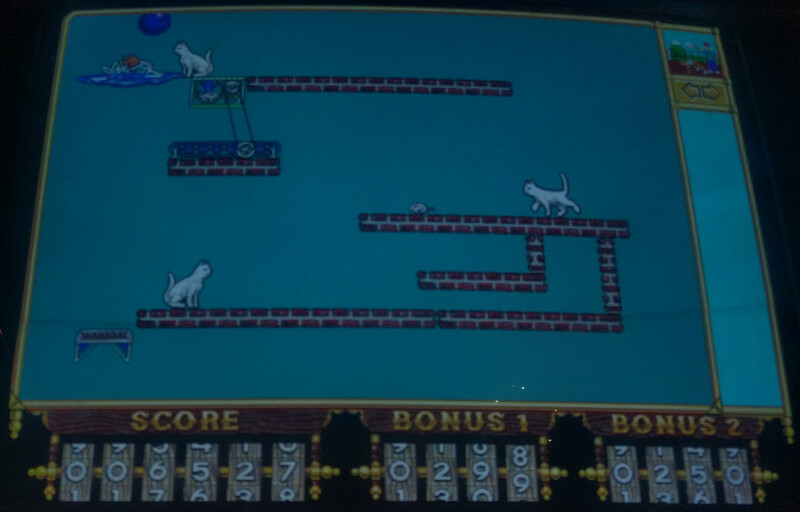 First up is The Incredible Machine published by Sierra/Dynamix in 1993. I prefer to read up on it after I’ve played it but I do know it was originally going to be a C64 game many years earlier but got held back for other projects. It was still largely the effort of one coder being developed on a shoestring budget. 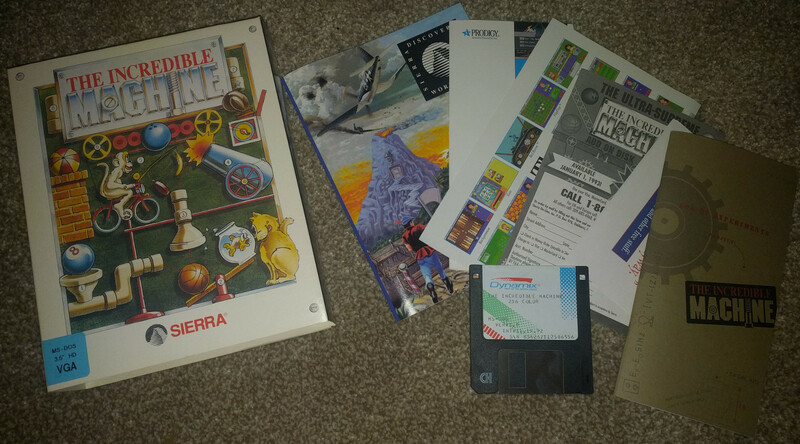 The box is the usual Sierra fare from this period full of adverts for the likes of the Sierra Network. More unusual for one of their games is that it only contains the one disk and the game doesn’t even fill that one disk up. Sierra put out AGI games that used more disk space than this. The manual portrays the game as a genius simulator where us mere mortals can get the experience of being a maverick scientist. 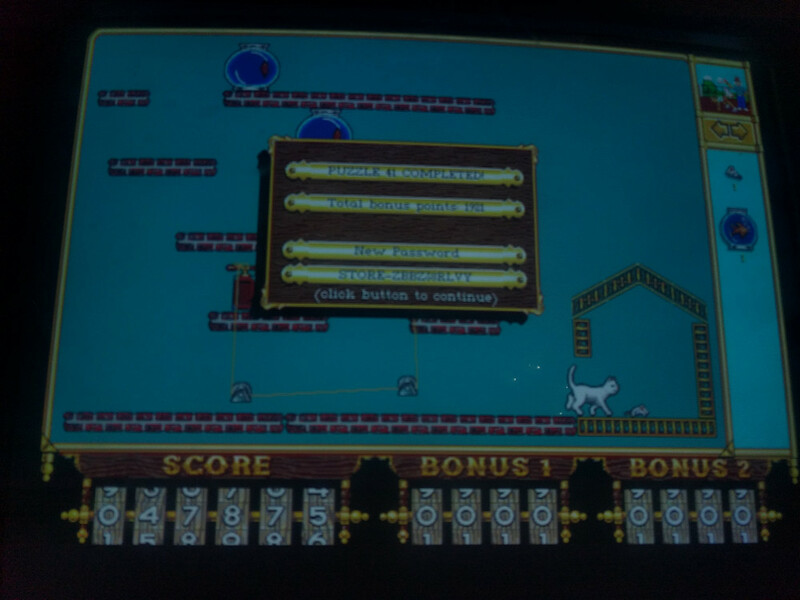 In reality, it’s a puzzle game where you have to place some of the 45 or so components available on screen in such a way as to make something or other happen when the machine is started. For example here is one of the earliest levels where the two bowling balls have to be moved into the containers nearby. The one on the left is preassembled and I just have to mirror it on the right. Nothing moves until the machine is started at which point gravity will affect any unsupported objects kicking things into life. 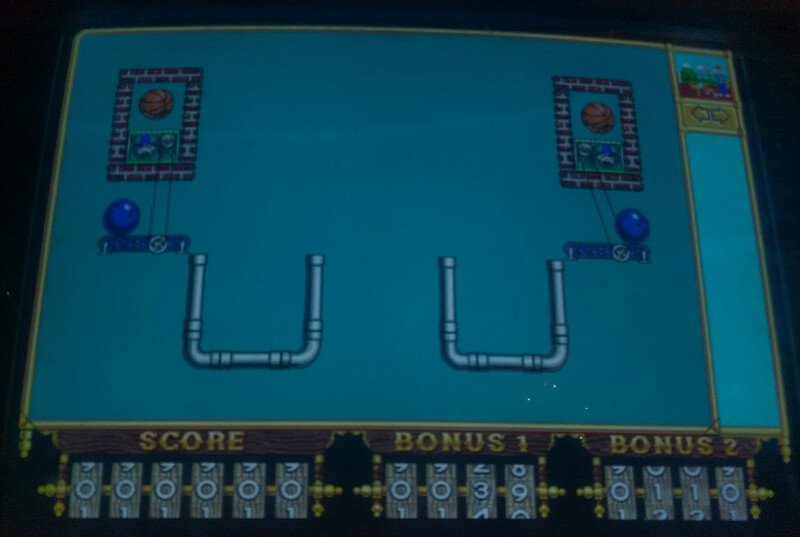 In this case the basketball falls on the mice, which starts them running and they power the conveyors under the bowling balls moving them into the baskets. The game offers a huge number of machine parts which are gradually introduced before things get too complex. I do like how untechnical some of these are. The notion of having to move a cat around the screen by enticing it with goldfish or mice is amusing (if not all that realistic) and not my usual idea of a machine. The puzzles can be quite fiddly requiring very precise placement but I quite like this aspect of it. E.g. 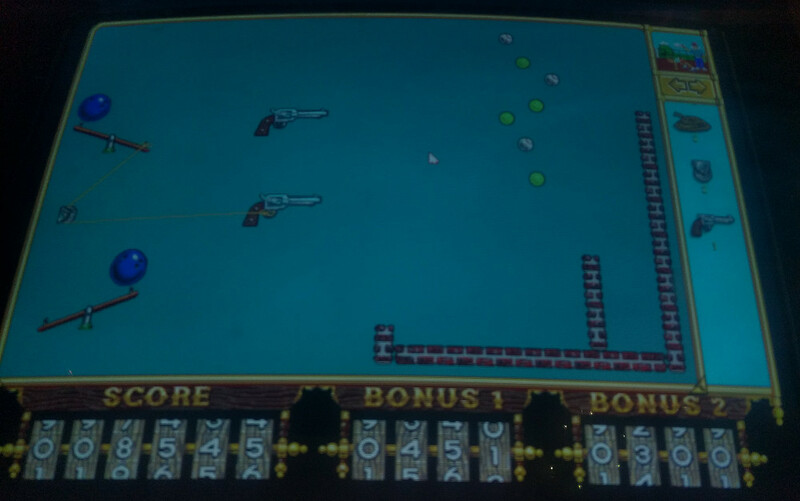 in one puzzle, I had to use 3 guns to shoot 3 baseballs into a container. The moment the machine is started all the balls start to drop and gun placement has to be precise so that the bullet hits the right ball and pushes it over to the container. Despite this there is no one solution here as the balls starting bouncing against each other and it’s just a case of trial and error. The machine can be reset any number of times, tweaked slightly and started again. There is the notion of scoring points for being quick but I doubt many players pay too much attention to the score. The music is upbeat and quirky and sounds equally at home on General MIDI or MT-32. It reminds me of the fantastic Willy Beamish soundtrack which isn’t entirely surprising as the same composer worked on both games. The sound is minimal but adequate with some effects for firing a gun/cannon and the like. The graphics in the game are in a hi-res (for 1993) 16 color VGA mode. This was a good call as the game simply wouldn’t have worked at 320×200. The 16 colours doesn’t allow for detailed graphics but the cartoony 2D look suits TIM well enough. The interface could use a little refinement. If a puzzle requires more than 5 components you have to flick through each group of 5 on the right of the screen using the arrow buttons. It’s crying out for a scroll bar with mouse wheel support. Another annoyance is that the game doles out text codes every time I complete a level. I could seriously live without having to store and type these in to pick up my progress again next time I play the game. It does at least tell me the last code used when I exit to DOS. Other than those points, this is holding up really well for such an old game. Puzzle games like this seem to have a timelessness that isn’t matched in other genres. TIM spawned no end of sequels and I can see why. It’s a clever concept, genuinely original and so far at least has somehow managed to not be at all frustrating – a rare quality in puzzle games. I’m definitely not convinced about the games longevity. The box says there are “over 75 levels” and I got through 41 last night in not much over an hour. I have played this before but can’t say I remember the individual puzzles. Maybe the solutions are buried in there somewhere and speeding up progress but I’m not convinced. Things are getting trickier so I expect progress will start grinding to a halt before much longer.